Intel’s Optane Memory H10 SSD will begin shipping soon in pre-built systems from major OEMs, so Intel’s ready to unveil more detailed information about the drive firstpreviewed earlier this year at CES. The Optane Memory H10 is a significant change from the existing Optane Memory family of products, and is a unique 2-in-1 SSD combining 3D XPoint memory and QLC NAND flash memory on a single M.2 module. 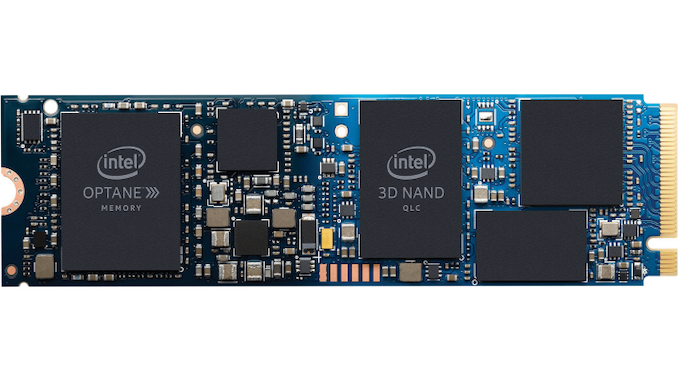 The H10 is essentially a consolidation of the existing Optane Memory M10 module and the Intel 660p QLC SSD onto a single drive. The Optane portion of the drive is intended to be used as a cache for the QLC portion of the drive, using the Optane Memory caching drivers for Windows that Intel has previously pitched for using with standalone Optane Memory M.2 modules and mechanical hard drives. Until now, Optane products have been difficult to fit into ultrabooks where two M.2 slots may be challenging and a 2.5″ hard drive is out of the question. The Optane Memory H10 will come in three varieties, with QLC NAND capacities ranging from 256GB to 1TB. The 256GB model will have 16GB of Optane storage while the 512GB and 1TB will both have 32GB of Optane storage. All three capacities are implemented as single-sided M.2 modules, with approximately half of the card dedicated to the Optane controller, media and PMIC, while the other half contains the Silicon Motion SM2263 controller, DRAM and QLC NAND. The card as a whole has a PCIe 3.0 x4 interface, but each of the two SSD controllers gets just two PCIe lanes. Intel’s caching software will support reading and writing data from both Optane and QLC simultaneously, so they rate the H10 for up to 2.4GB/s sequential reads even though neither half can exceed 2GB/s on its own. For random I/O, Intel rates the H10 for 32k random read IOPS and 30k random write IOPS at queue depth 1, and 55k IOPS for both at QD2. The random read ratings are significantly higher than we’ve measured from the Intel 660p QLC SSD, but are only a fraction of what the 32GB Optane Memory is capable of on its own, so Intel’s clearly trying to provide a more realistic composite that reflects how real-world usage won’t be able to entirely stay within the Optane cache. Officially, Intel is requiring the H10 to be used with a 300-series PCH and an 8th Gen Core U-series mobile processor, but that mostly reflects which platforms will be offering the H10 at launch. Intel has not yet committed to bringing the H10 to the retail market for use in desktop systems, but they have been laying the groundwork and many 300-series motherboards have firmware updates available to enable booting from the H10. (The first public leak of the Optane Memory H10 product name came from motherboard manufacturers advertising support on 300-series desktop boards.) Desktops with 300-series chipsets and at least two M.2 slots can already achieve essentially the same setup as the H10 using an Intel 660p and Optane Memory M10 module, so there isn’t strong pressure for a retail release of the H10. The hardware features Intel relies on for Optane Memory caching and NVMe RAID on consumer platforms have been present since Skylake 100-series chipsets, but Intel has shown little interest in rolling out firmware support to older platforms.